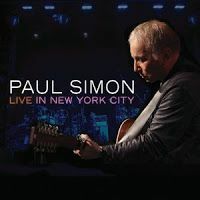 During his 2011 tour, Paul Simon played to home town fans at historic Webster Hall. That show was captured on film and will be released on September 18 by Hear Music as Live in New York City. The album was recorded in superb high-definition by director Martyn Atkins along with sterling audio mixed by Phil Ramone and Andy Smith, will be available in three formats: 2-CD/1-DVD special package, Blu-Ray and Standard DVD. The 20-song, 90 - minute set list was drawn from his legendary career and includes several songs that haven’t been performed live in many years. Kodachrome, Mother and Child Reunion, Gone At Last and The Obvious Child are just some of the highlights as well as songs from Simon’s most recent album, 2011’s So Beautiful or So What (Hear Music/Concord Music Group) including Dazzling Blue, Rewrite, The Afterlife and the album’s propulsive title track. Joining Paul on the show is a stellar band of musicians including Cameroonian guitarist Vincent Nguini, guitarist/drummer Jim Oblon, pianist Mick Rossi, saxophonist/ keyboardist Andrew Snitzer, bassist Bakithi Kumalo, guitarist Mark Stewart, master percussionist Jamey Haddad and multi-instrumentalist Tony Cedras.